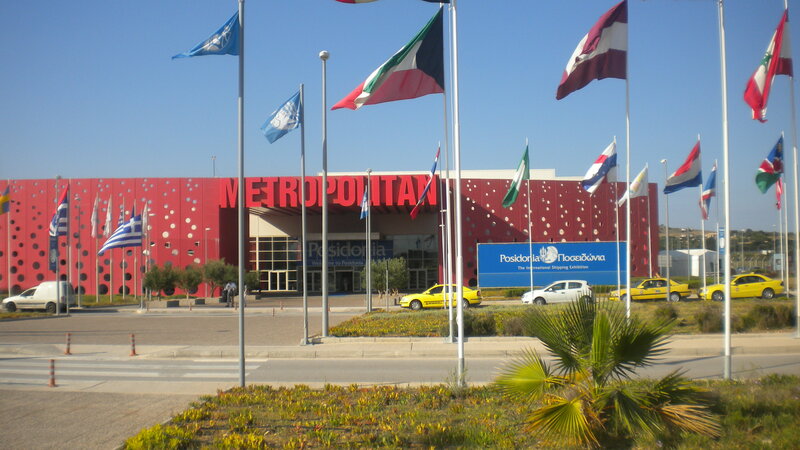 PARTICIPATION OF SNAME IN THE 2014 POSIDONIA INTERNATIONAL MARITIME EXHIBITION IN ATHENS, GREECE. From June 2 to 6, 2014 SNAME participated again in the biennial Posidonia Exhibition. This was SNAME’s sixth participation and for the first time SNAME had its own independent stand, which was within the USA pavilion. President elect Joe Comer, Exec. Director Erik Seither and past President & current Treasurer Bruce Rosenblatt attended the Posidonia Exhibition and were on hand at the SNAME stand. 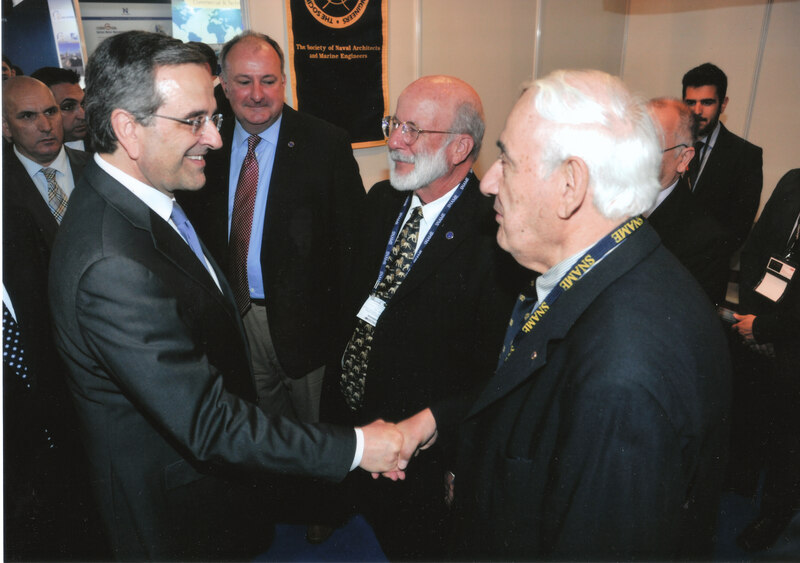 The Prime Minister of Greece, Antonis Samaras, the US Ambassador in Athens, David Pierce, and the US Acting Maritime Administrator, Paul Jaenichen,Sr visited the SNAME stand as well as many persons from around the world. During the exhibition around 20 new member registrations were made, while more than 25 publications were ordered. All the arrangements and preparations for the stand (renting furnishings, services, payments, etc ) were made by SNAME’s European Regional Office ( SERO ) and the stand set up was made with the help of NTUA SNAME student members. In total 24 volunteer SNAME members attended the stand in three shifts. 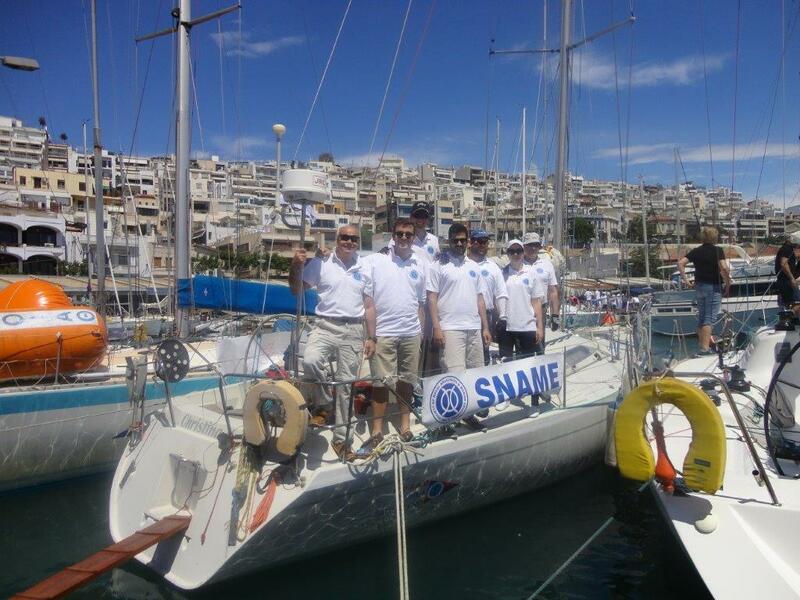 SNAME also participated in the 2014 Posidonia Regata, with seven SNAME Greek members crewing the boat. There were 60 sailing boats in the race, in Performance, Standard, IRC and Classic divisions. This time, the Hellenic Offshore Racing Club inexplicably placed Christina II, the SNAME chartered boat, in the group of 19 Performance Yachts and was the slowest of all in handicap rating. Under these circumstances, the winning prospects were drastically diminished. Thus, she came last in its group, while four boats in the same group failed to finish, due to damages from the rough seas and force 6/7 winds. 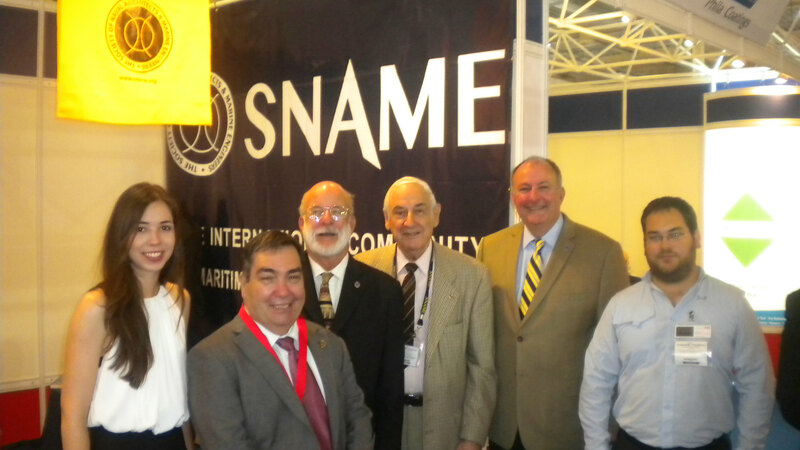 Finally, Mr. Ferhat Acuner, the vice chairman of the Chamber of Turkish Naval Architects & Marine Engineers visited the SNAME stand and asked for collaboration and joint activities with SNAME. In the images below: The SNAME crew aboard Christina II before the start of the race; The impressive entrance of the Metropolitan Expo where the Posidonia Exhibition was held in four huge halls; The Prime Minister of Greece Antonis Samaras at the SNAME stand; and K. Stamou; J. Kokarakis; J. Comer; P. Lalangas; E. Seither and V. Tsarsitalidis at the SNAME stand.